Now’s the time to think about what you and your dog will be up to this summer. Will it be going on vacation with the family, or enjoying the longer daylight by spending more time together outdoors? Do you have any new training or behavior objectives for your dog? Here are some ideas to think about. Decide to Travel with Your Dog. If you make the decision to travel with your dog, then you will find yourself undertaking to work out your plans to make that a reality. It may be that you need to adjust your plans somewhat, but where there’s a will there’s usually a way. For example, you might decide to drive rather than fly, if your dog doesn’t meet airline requirements. Of course, if you need to leave your dog at home for trips that fall outside a canine’s travel sphere, there are a lot of terrific options these days, so your dog will probably have a great time without you! The choice to vacation with your dog can also affect what you do and where you stay, quite possibly for the better. For example, if you decide to drive, you might then go for a scenic route rather than the quickest highway destination. 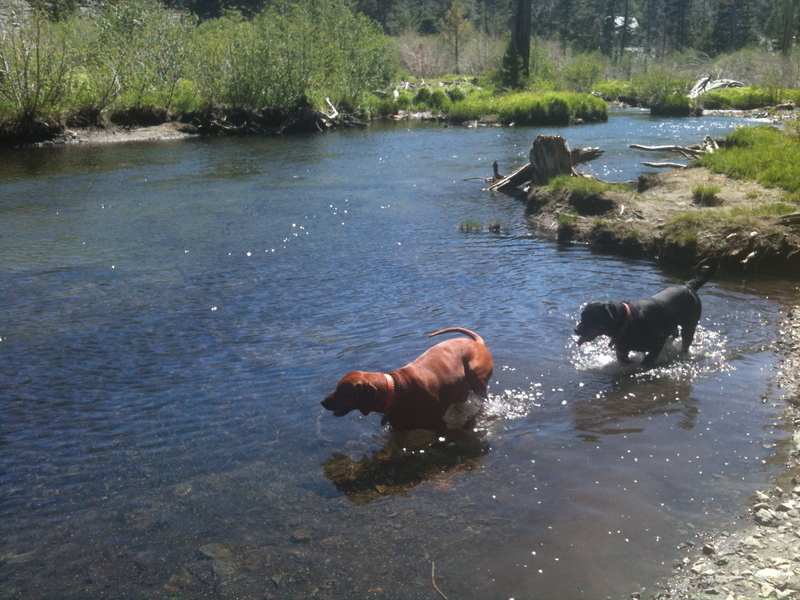 And you might then research and find accommodations that take dogs, including dog-friendly camp sites. You can alternate between dog-friendly places and kennels too, so having your dog doesn’t limit where you can stay. Also many kennels these days take the open doggie-daycare approach. 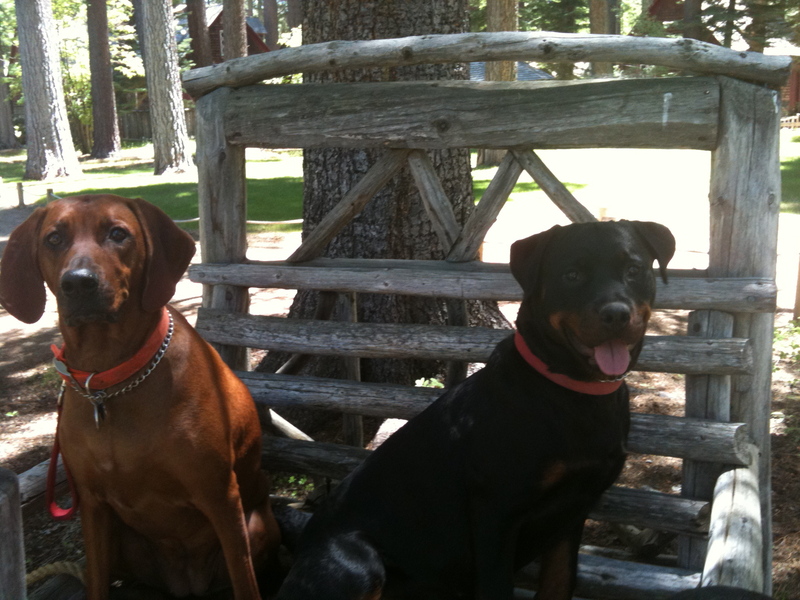 We go to family camp near Lake Tahoe every year, and they don’t take dogs. So now I board our dogs in town and take them out to hike with me every day. Because of that, for myself I am now doing longer and better hikes, with the joyful company of my dogs. This year my adult dog Lady got to teach my young dog Penny about how to go on hikes, how to swim, and how to meet other dogs in that context. Penny learned so much from getting to be just another dog on the dog-friendly beaches of Lake Tahoe, where no one is stressing about what your dog looks like. 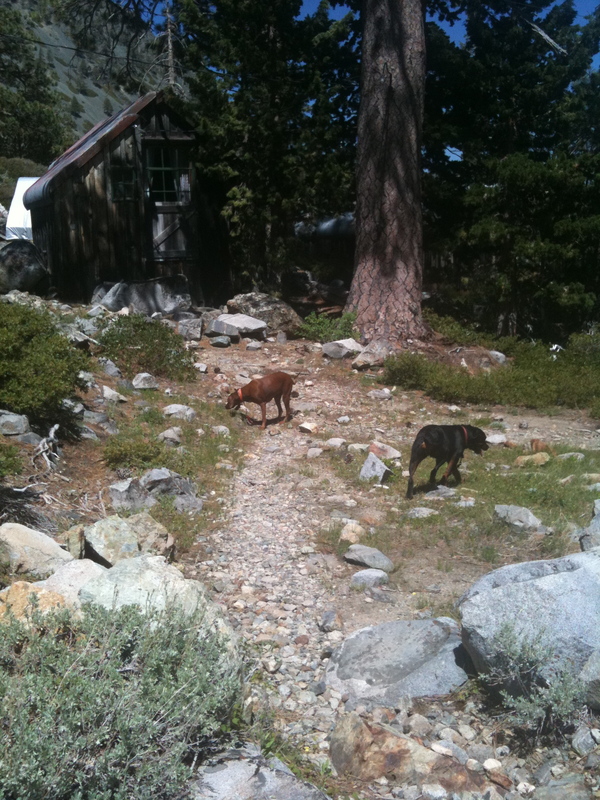 We enjoyed pet-friendly Kiva Beach and Tallac Historic sites with our dogs at South Lake Tahoe. Explore Dog-Friendly Options Here. Now is the time to expand your horizons with your dog here in town. You may have a set routine of where you go for walks and the like, so why not use the nice weather to discover some new things to add to your repertoire? At Town & Country Village, for example, there are quite a few restaurants with outdoor seating. You can grab a salad at Calafia Market A-Go-Go or a burger at Kirk’s Steakburgers, and sit outside with your dog. Or you can get something from Trader Joe’s and just grab a bench. Also try running your errands with your dog — Palo Alto Ace Hardware gives out doggy treats, as does Books Inc. Palo Alto. So try something new where you can take your dog. It’s great for their socialization and their simple wish to be with you, always. It’s great for you because perhaps you will walk or ride your bike, and certainly you will chat with more people as dogs are such a nice calling card. Give your dog a job by buying them a dog backpack, and have them carry your water and other stuff for you. They will be very proud of themselves. Work on Some Stuff. If your dog has any issues that are holding you back from trying more things this summer, then make it your plan to start working on them. Check out the AKC Canine Good Citizen test criteria, and see where you stand. If your dog is just great, then try giving him a new job or teaching him something new for fun, or taking him somewhere new. If your dog has some trouble with people or other dogs, don’t hide out — get to work on it. There is a lot of shame that people carry around their dog issues, which needs to be let go of. Recently I ran into an acquaintance in the parking lot outside a bakery, who had his dog in his car. I said, do you want our dogs to meet? What I got was a long discourse on how his dog was people aggressive, and how they weren’t told by the vet that the dog needed socialization as a puppy and all the problems with the dog and how it wasn’t their fault. I said okay no problem, let me know if you want to work on our dogs together! In other words, I absolve you, it doesn’t matter why you are where you are, and let’s just move forward. So one way or another, take your dog out and give them the repetitions they need in the world to be a good dog citizen, with lots of food or other rewards, but do it in a safe way, so there’s no stress on you or on other people, as besides being a bummer, that stress can easily transfer to your dog and thereby defeat your whole effort. Postscript: By the way, a muzzle is a training tool, not a scarlet letter. I find that even some people I know with working dogs have an emotional issue with using a muzzle even when it’s to load their dog into a helicopter, and I think this is telling of how we are all susceptible to anthromorphizing our dogs. It’s not a judgment that your dog is a bad person if you have it wear a muzzle in some circumstances; in fact it shows that you’re a conscientious and sensible dog handler. I often carry a muzzle just in case it might be useful — for example to set a human at ease when my large powerful dog meets their small dog, even though the small dog is the one barking and lunging from the owner’s arms. That said, it helps to announce that your dog is wearing it as a training tool, in order to educate people, or else they might assume your dog is that bad person. I’ve had a number of people think that another useful tool, the Gentle Leader halter is a muzzle (it’s not, it’s like a halter you put on a horse or sheep to lead them), so often people just need to be informed and put at ease.